For World Breastfeeding Week 2012, I’m hosting a series of giveaways to celebrate. 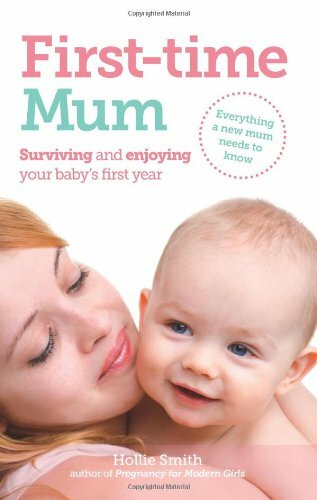 Today, I have 3 copies of Hollie Smith’s latest book, First Time Mum: Surviving and enjoying your baby’s first year to give away. The book covers the first year of baby’s life, and starts with some great equipment shopping lists which are broken down into essentials, sometimes useful, and completely unnecessary items. I was sold on her criteria when I saw scratch mitts listed in the pointless section – I was given so many and they fell off within seconds! So simple when you know how! It also covers some of the bigger but less talked-about issues for new mums – the mum & baby groups, isolation and adjustment to the new role, baby blues and postnatal depression, and even a potential return to work. These are a bit hidden at the back of the book, but well written and useful. There are a couple of mentions of Gina Ford schedules (vs demand feeding) and Cry It Out type sleep training, which made me cringe a bit, but I guess if I want to read a balanced, largely unbiased guide to the first year, then I can expect them to be mentioned. To be clear, they were mentioned, explained, but not recommended, and she did make it clear that most health professionals believe demand feeding is important for continued breastfeeding. Having read the recent research on CIO and the effect it has on brain development, it was interesting to know that although she used these sleep training methods with her own children, she would perhaps choose a gentler approach now. …while some women sail through the start of breastfeeding, for many, it’s no picnic. And it’s better to go into it with realistic expectations and then find it’s easier or more enjoyable than you thought, than imagine it will be some kind of rose-tinted rush, only to experience the absolute opposite. The author has personal experience of feeding both ways and assumes that most mums will try to breastfeed and that some will then move to formula, which is statistically accurate for the UK. It was good to see instructions for making up a bottle safely too – I still don’t know how, and assume other parents are similarly clueless, plenty of whom actually need that information to look after their child. All in all, a good read and one I would probably have appreciated before small one was born. Don’t forget to enter the other World Breastfeeding Week 2012 Giveaways too. First Time Mum by Hollie Smith is available on Amazon for Â£8.35 (paperback) or Â£6.00 (Kindle edition). I received a free copy of the book for the purpose of this review. Giveaway Terms & Conditions: Restricted to UK & Ireland. Closing date: 18th August 2012, 23:59. Winners will be picked at random from entrants. No cash alternative. If the winner cannot be contacted after 7 days, an alternative may be drawn.